The Swimbait bug bit Moorman less than three years ago when he caught his very first swimbait fish on a River2Sea Bottomwalker. Shortly after this, he discovered the Huddleston Deluxe Rainbow and as Moorman himself describes, after that it was all over. 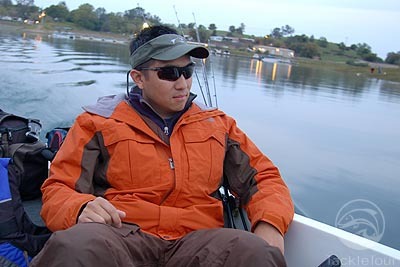 He has since landed twenty three bass over ten pounds and some incredible limits including multiple forty pound plus days, and even a few fifty pound limits. While this isn�t the norm there is no doubt in Moorman�s mind that his success catching both big fish and massive limits is due to the big baits. 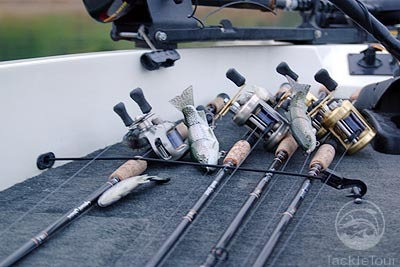 Common with many anglers today, Moorman also happens to frequent a few of the Internet message boards dedicated to fishing. That�s really where our introduction to Moorman came, in our very own discussion forum. His credibility, insights, and practical approach to trophy fishing were immediately evident, but then came a question regarding the relatively new, six-inch version of the venerable Huddleston Deluxe swimbait. As it turns out, Moorman is good friends with a few of the West Coast big bait manufacturers and Ken Huddleston is one such friend. 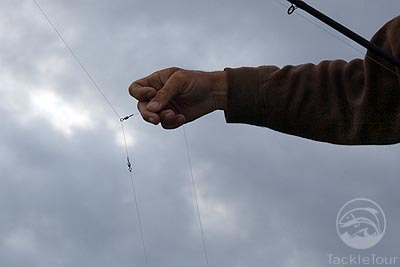 We suspect Moorman as been fishing the six-inch Hudd for quite some time, but we haven�t asked him to betray this confidence. Of note in the discussion thread was Moorman�s description of his DOUBLE Six-inch Hudd Rig, but as with all discoveries of this sort, words simply were not enough. 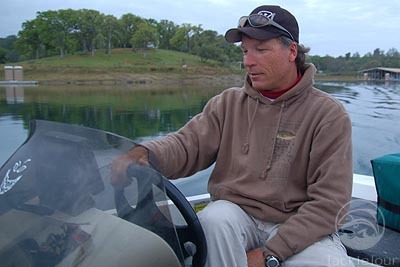 We got in touch with Moorman shortly after he made this announcement, and today, we share with you, our day on the water with Don Moorman where he shows us his Double Hudd Rig along with his approach and mindset on a day hunting for trophy sized smallmouth and largemouth bass. We launched at the break of dawn at Lake Pardee. 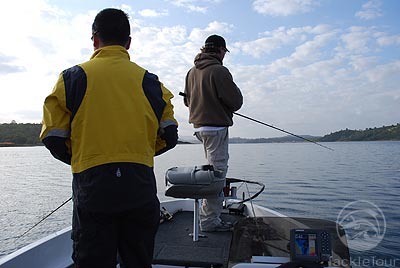 We chose this lake not only for the potential of big smallmouth bass, but also for the lake�s water clarity. 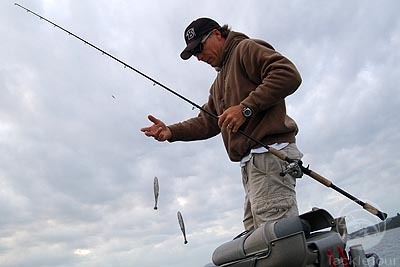 We wanted a close look at the Double Hudd Rig, as well as his techniques, and the incredibly transparent water at Pardee offered over 30 feet of visibility.